Please arrive 5-10 minutes before the class is due to start. All classes start on time, if you are late your place may be offered to another student. If you would like to cancel or modify a reservation, click “Cancel.” In this instance the course fee will be added to your account to enable you to book onto an alternative class. “Late Cancel” appears when the online cancellation period has passed. This option can be used to release the place to allow another person to book. If cancelled 12 hours before the class is due to start you will receive a refund to your Leeds Aerial Arts account which you can use towards an alternative class. If cancelled with less than 12 hours notice before the class is due to start, there is no refund unless a medical reason is provided with a a medical note. 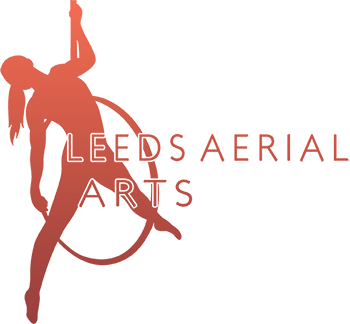 If a medical note is provided you will receive a refund to your Leeds Aerial Arts account. 6 Class Passes are valid for 8 weeks from the date the class pass is activated on your first visit. 10 Class Passes are valid for 12 weeks from date the class pass is activated on your first visit. Please contact lorna@leedsaerialarts.co.uk if you have any questions regarding class passes or cancellations. 1 class passes are valid for 30 days from the date of purchase. Once a Class Pass is purchased it cannot be transferred for use on any other Leeds Aerial Arts product or service. If cancelled with more than 24 hours notice before the course start date, the course or workshop fee will be refunded to your Leeds Aerial Arts account. If cancelled with less than 24 hours notice before the course start date, there is no refund unless a medical reason is provided with a medical note. Once a place on a course or workshop has been purchased, it cannot be transferred for use on any other Leeds Aerial Arts product or service. If cancelled 24 hours before your private lesson we can refund the full amount of the class cost to your Leeds Aerial Arts account. If cancelled outside of the 24 hour notice period you will be charged the full cost of your lesson. During our Holidays we will add the time back that we are closed to your class pass, this does not include bank holidays. “Late Cancel” appears when the online cancellation period has passed. This option can be used to allow another person to take your place. For more information, please contact Lorna at Leeds Aerial Arts on 07792081278.